Come fall, come dead leaves, school, earthy produce, crisp apples and pears, come thanksgiving, come the quintessential pumpkin pie. Sweet, spiced, and homely – more comforting than a snuggie, this cruelty-free alternative is every bit as delicious and nostalgic as its worshiped brother. Or at least, I think. 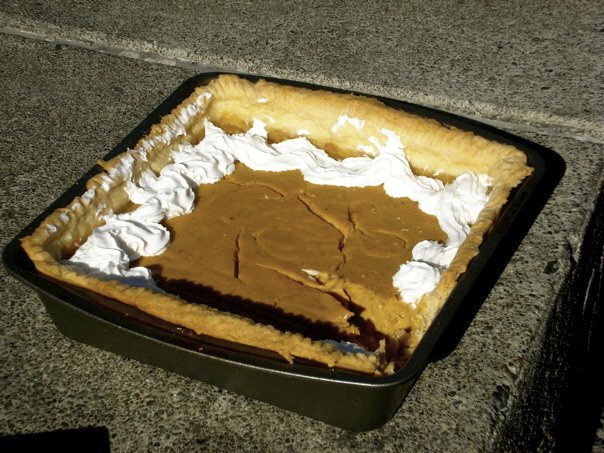 I’ve never had real pumpkin pie, but as far as I’m concerned, this pumpkin pie is every bit as real and infinitesimally more loving than regular pumpkin pie. This one comes sans animal. Like coconut cream pie, the key to this pumpkin pie is the tofu. Use mori-nu vacuum sealed tofu (not always in the refrigerated section) for more of that concentrated pumpkin taste and less of that tofu-y flavor. To prepare filling: blend all ingredients in a food processor or blender until completely smooth. Add sugar/spices to taste if needed. To prepare crust: whisk together flour and salt. Cut in earth balance, margarine, or shortening and begin to mix using mixer or by hand. Sprinkle in cold water a table spoon at a time and mix after every few tablespoons. Bake in oven for 1 hour until filling has cracked and set. Remove from oven and let cool and then refrigerate for at least 2 hours before serving. Serve with vegan whipped cream if desired.